17 Cookware Items Under $10! Artisan KitchenAid Stand Mixer over 50% off TODAY! With the weather improving every day just about everywhere now, more and more people can’t wait to take advantage of the great outdoors. Whether hiking, throwing a frisbee or simply meeting up with friends, no-one wants to stay cooped up inside any longer than they have to. But with each of those incredible outdoor activities comes one thing: you’re going to get hungry after you’re done! 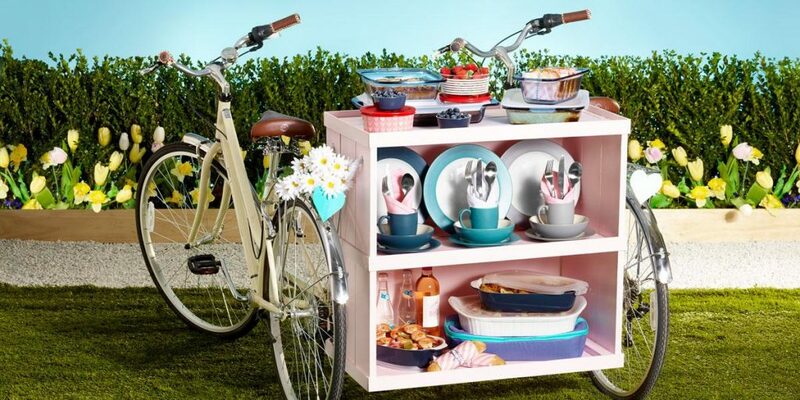 So if you’re already planning to meet up with friends or take the family out for some fun in the sun, why not turn it into the ultimate picnic potluck? Whenever we ask friends over for lunch or dinner, their first response is typically, “What can we bring?” After all, part of the fun of picnics is to have a wide variety of foods to sample. If you’re the one doing the inviting, a good rule of thumb is to provide the main course, but then ask your guests to bring a side dish, drink or dessert. If it’s a small group (you and another family or a group of 4 friends or less), divide everything up evenly (one person brings drinks, one brings a side dish, one brings a dessert, for example). However, if you’re looking to make your ultimate picnic potluck TRULY ultimate by inviting a large group (say your kids’ classmates or a weekend team you’re a part of), then use last names as a guide. For example, A-H last names bring a side dish, I-P bring a main dish & Q-Z bring a dessert. Make sure to bring enough plates, cups & utensils for everyone. It’s cheap and easy to pick up a large pack of these that will be enough for all your guests and it’s a kind gesture that will be appreciated. Pack your food in containers that are spill-proof and easily transportable. I love this Pyrex portable prep & bake set because it meets both those requirements. Bring everything in a large, water-resistant tote that can both withstand spills and carry some extras (like a blanket for sitting on or the toys and shoes you know little ones will kick off or forget about once they’re there. The worst thing you could do is NOT have a picnic because you’re afraid of the work that goes into it. As you can see, a picnic is the ultimate forum for a potluck. And it doesn’t have to be a gourmet production either; you can even pick up subs from your favorite sandwich shop if the food prep is too daunting. Just make sure to bring something to play with, something to sit on and something to sip and you’ll be all set!